"Mum, I think the parcel man is at the front door," Sophie cried. "It is probably a parcel for Callum," Mum said, getting up and heading towards the door. In a few minutes she was back with a package in her hand. I rushed over to Mum. "Who is it for?" I asked eagerly. "It is the sewing book I ordered for you and the other girls," beamed Mum. "Can I open it?" I asked impatiently. "If you want to," Mum smiled. 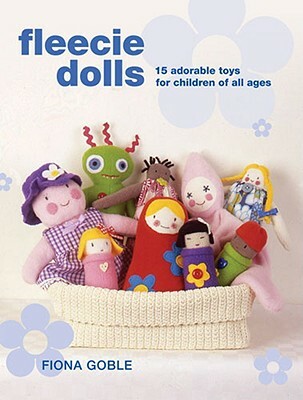 I tore off the wrappings and inside was a sewing book called Fleecie Dolls. I started flicking through the book. "That mermaid is so pretty," Imogen exclaimed. "Look at her tail," sighed Mum. "It's covered in pretty sequins." I found a needle, some thread and a piece of fleece and set to work making that pretty mermaid. I really enjoyed sewing the doll and soon the body and tail were finished. "Mum, you marked the white fleece with a dark pen to show me where to sew the dart..." I started to say. "Yes, what is wrong? Did the pen show through the fabric?" Mum asked. I nodded. "You had better give your doll a bath to get rid of the pen marks." I grinned. I was about to give a mermaid a bath. Soon I was scrubbing the doll with a bar of soap. "Imogen, look! I am giving my doll a bath," I squealed. A few days later I was ready to start putting sequins on my mermaid's tail. Mum showed me how to sew the sequins on and I was soon sewing them on all by myself. But then disaster! "Mum, I have lost the needle." "What do you mean?" Mum asked getting up. "When I was sewing my sequin on I lost the needle inside the mermaid," I spluttered, close to tears. Mum and Imogen searched the mermaid and the seat, and even Jenny the cat who a few minutes ago had been perched on my lap. "I can't find it," announced Imogen. "You can use my needle to finish sewing the sequins on," Charlotte offered. "You will all have to watch your feet," Mum warned, "in case the missing needle is still on the floor." "Mum, I am ready to sew my mermaid's hair on," I grinned. Mum handed me some wool and some orange fleece. "Do you want me to help you with the hair?" Mum asked. "Yes please," I thanked. Sewing the hair on was not as easy as I had anticipated and our fingers got frequently pricked. On Sunday Charlotte drew the face on the doll with a fading pen so I knew where to sew it with a needle and some thread. After lunch I headed to the table all ready to sew the face on. "Mum, the face has faded and now I can't see it," I wailed. "It has faded all ready?" Mum asked in surprise. Charlotte patiently drew the face back on and I started to sew the eyes. After one eye I was already having trouble seeing the face. After both eyes I could not see the mouth at all. The pen marks were fading again. "Charlotte, can you please draw the mouth on one last time?" I asked. Finally the mouth was done and the only thing left to do was the bikini top. Mum carefully measured out some ribbon to make a top, and then tried to fit it round my mermaid's waist. "She is too fat," Mum declared. "We will need to cut a bigger piece of ribbon." "Mum, I have finished sewing the top," I announced happily. "Could I please have a button to sew on the ribbon?" Mum opened up her button box and found a button that looked like a pearl. "Will this do?" she asked. "Oh yes," I breathed. I sewed the button on. I'd finished the doll. For the rest of the evening I went around showing everybody my wonderful doll. I love my mermaid. Next I am going to make this doll called Florence. That doll is lovely. I will have to make one myself.